EDpuzzle is finally integrated with Google Classroom allowing you to share assignments and video lessons to your groups in Google Classroom. With this new update, EDpuzzle imports your courses from Google Classroom so when you click on finish button after creating a video lesson or quiz you will be able to see your Classroom groups listed in the pop-up window. You simply select the class and assign your lesson. Additionally, you can connect your EDpuzzle classes with your Google Classroom with a single click. And if you have new enrolled students later in the year, you can import these students from the Members page on EDpuzzle. Watch the video below to learn more about Google Classroom integration with EDpuzzle. For those of you who are not yet familiar with EDpuzzle, this is an excellent web tool to use for creating video lessons. You can upload videos from YouTube, trim the parts you want, add your voice recording or embed questions 'to hold your students accountable during the video'. 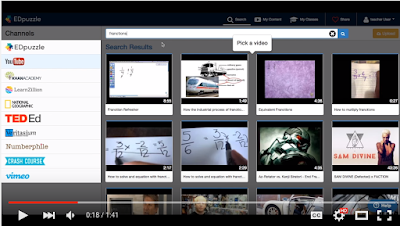 EDpuzzle lets you create classes for your students so you can easily share with them video lessons and quizzes you create. Students will have to register (email is optional) in order to be able to receive and interact with your assigned videos. Using the progress report, you will be able to track the progress of each student on the assignment. You will get to know who ‘ watched the video, who didn't understand the lesson, and who did a good job.’A detailed guide on how to use EDpuzzle with your students is to be posted in the next few days. Stay tuned.